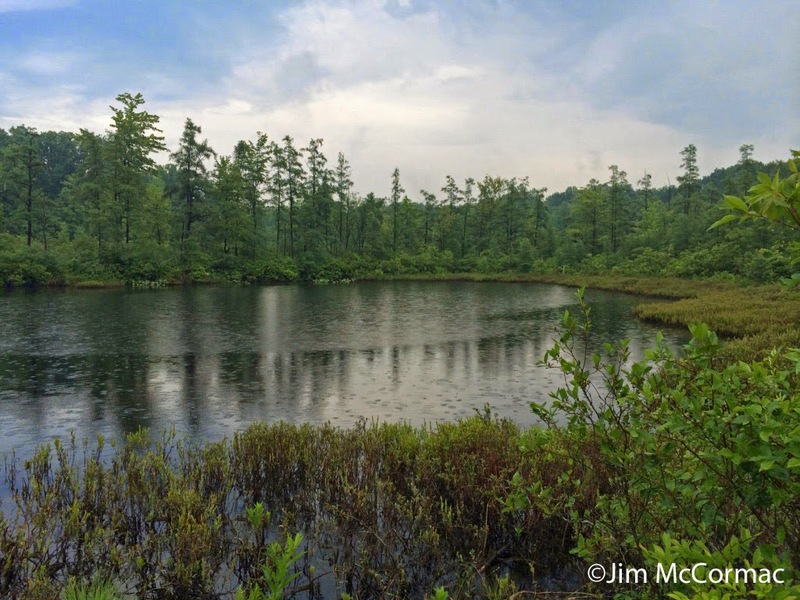 Triangle Lake Bog State Nature Preserve on a rainy day. I traveled to northeast Ohio last Sunday for a gig, and left bright and early to visit one of the coolest preserves in Ohio before heading over to Cleveland. While kettle lake bogs would have been commonplace in parts of Ohio for thousands of years following the last glaciation (10-12 thousand years ago), most have long since succumbed to the processes of natural plant succession. Of the relatively few that remain here, in my opinion Triangle Lake, which is just outside of Ravenna, is the nicest example. It should be a must-see for any Ohioan interested in natural history. To find such bogs now, at least commonly, one must venture several hundred miles to the north. As the massive wall of ice that was the Wisconsin Glacier receded, large blocks of ice would regularly calve from its face. These enormous ice cubes would crash to the soft, newly exposed mire left in the wake of the glacier, and form kettle lakes. At first, the divots would be nothing but cold pools of clear water, but plants quickly invaded their margins. Over time, a highly specialized flora evolved and a bog was born. Eventually, plant life would expand to the point that the kettle lake would be completely covered by a bog mat. Now, most of Ohio's bogs have advanced to a state of swamp forest, their bog past scarcely discernible. Triangle Lake, however, still possesses all of the primary attributes of a kettle lake bog. There is deep open water in the center, which is ringed by a floating bog mat. Beyond that is a dense shrub zone, which grades into swamp forest. 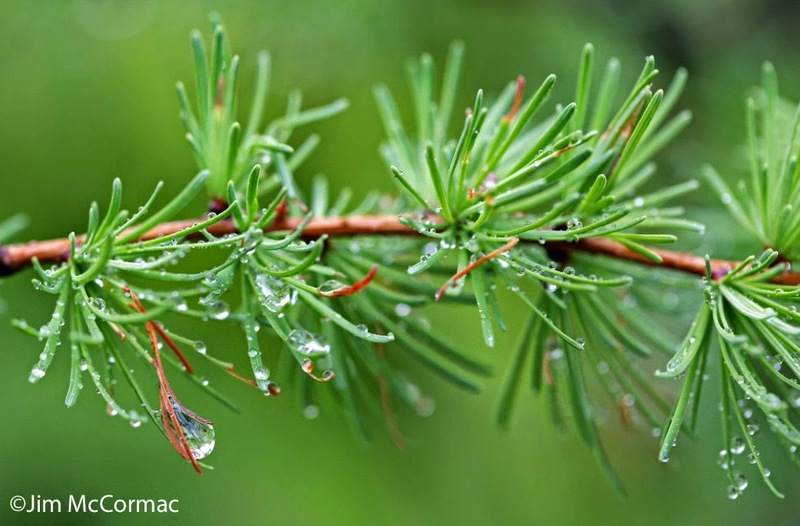 Pictured above is a branch of a tamarack, Larix laricina, a classic conifer of bogs. There are plenty at Triangle Lake, but overall this is quite a rare plant in Ohio. Last Sunday was a very wet day, and I only had a total of about 1/2 hour in which the rain abated to the point that camera equipment could be taken out on the boardwalk. Nonetheless, I was able to click off some images between downpours, and plants usually photograph quite nicely when beaded with water. 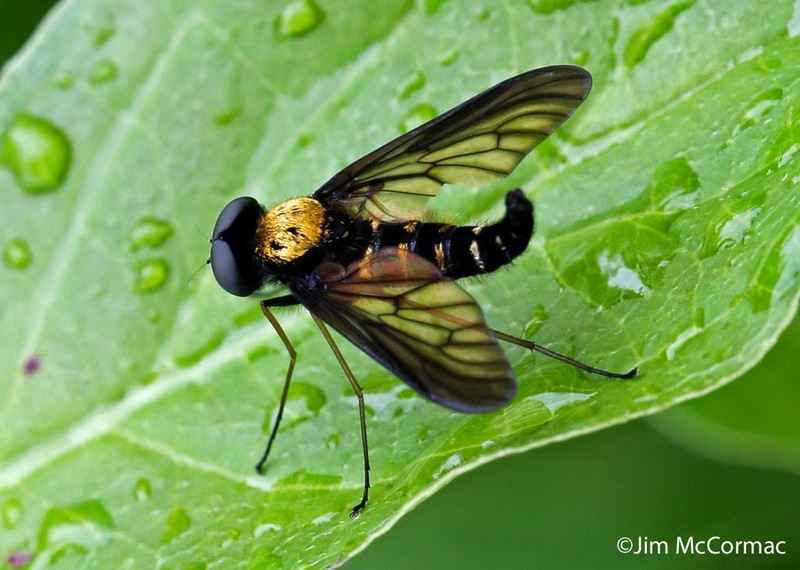 The rain kept most of the animals under cover, but this golden-backed snipe fly, Chrysopilus thoracicus, and several of its brethren did emerge. A relatively short and quite well built boardwalk allows visitors into the innards of the bog. Without it, a person would have a bear of a time gaining access. Thick shrub zones form a nearly impenetrable tangle around the outside rim of the bog. 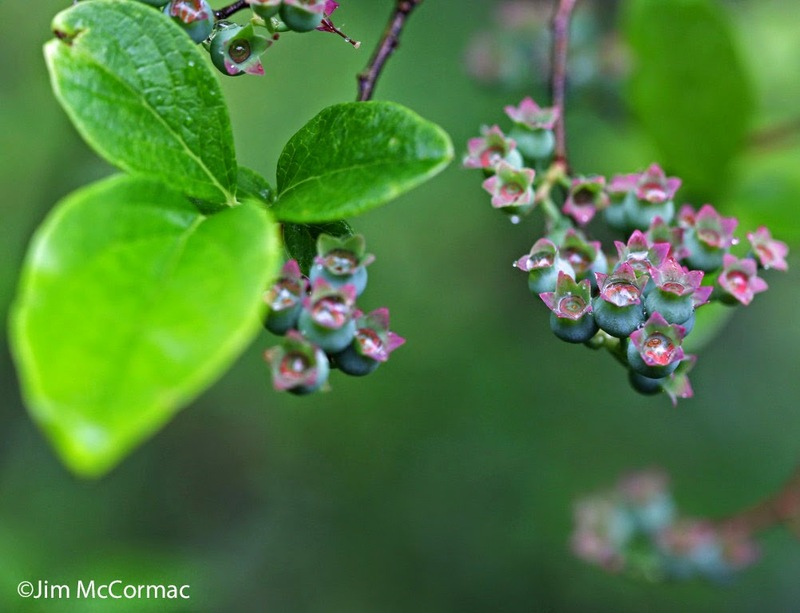 One of the dominant shrubs is highbush blueberry, Vaccinium corymbosum.Its blueberries are quite tasty, and the plant is commonly cultivated for the fruit. As can be seen from the photo, it will not be long until the berries are ripe for the plucking. But note, visitors, that this is a state nature preserve and people should not sample the plant life. What I had really come to see and photograph was the bog's supply of pitcher-plants, Sarracenia purpurea.The timing was good for this one, as most of the mature plants were in full flower. 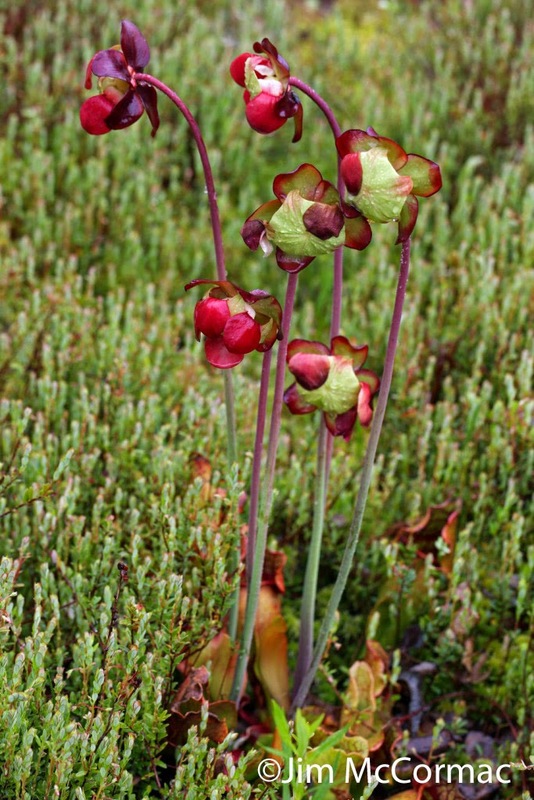 In this shot, a vigorous clump of pitcher-plants shoots from a carpet of large cranberry, Vaccinium macrocarpon. The latter plant, like the aforementioned blueberry, is commonly cultivated and provides us with commercial cranberries. Cranberry grows on thick tussocks of Sphagnum moss, which is the dominant substrate on open bog mats. 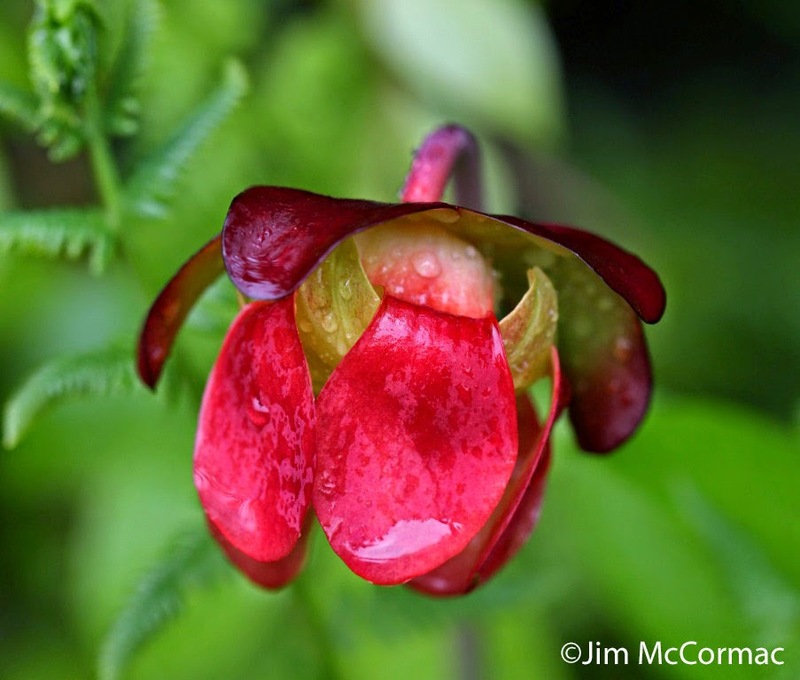 Pitcher-plant is officially listed as threatened in Ohio, and this rare plant is found in only a handful of sites, nearly all of which are bogs. There are one or two populations in fens, too. Close in on the strange flower of a pitcher-plant. The whole assemblage droops over so the flower faces the ground when fully developed. The dangling scarlet things that look like colorful basset hound ears are the petals. The purple protuberances at the top of the flower are the sepals. Visiting pollinating insects are drawn to the bright petals, and clamber up them to be forced into the flower's innards through gaps between the sepals. This forced entry route pushes the insect into contact with stamens and their attendant pollen. The stigma is like an upside down umbrella and forms the floor upon which the pollinator walks when it enters the flower. Insects bringing pollen from other pitcher-plants deposit it on the sticky floor of the stigma as they bumble about inside the flower, thus cross-pollinating the plant. The leaves of the pitcher-plant are modified into tubular water-filled death traps that capture insects. Thus, the plant is one of our few truly carnivorous plants. I wrote in some detail about the killing apparatus of pitcher-plants HERE. I highly recommend a visit to Triangle Lake Bog. If you can get there within the next few weeks, the pitcher-plant flowers should still be looking good. But anytime of the year is interesting. A visit to this bog is like stepping foot into Canada. For details about the preserve, CLICK HERE. Excellent, Andrew, I'll look forward to your post! I was just visiting Triangle Lake Bog a couple of weeks ago. The pitcher plants were kind of dried up. But, it was cool to see them. I need to get back there now that we had some rain in the area. I thought I read that there were also sundew plants there. But, I didn't see any. I also visited Herrick Fen, which is a protected bog in Streetsboro, Ohio. I also hope to visit Tom S. Cooperrider - Kent Bog State Nature Preserve in the near future, which is right down the road from Triangle Lake Bog. Few days Ago, I visited Triangle Lake. Wonderful pictures JIM! Great Job.